Descending into a private wine cellar to procure a delicious bottle isn’t a novel idea. 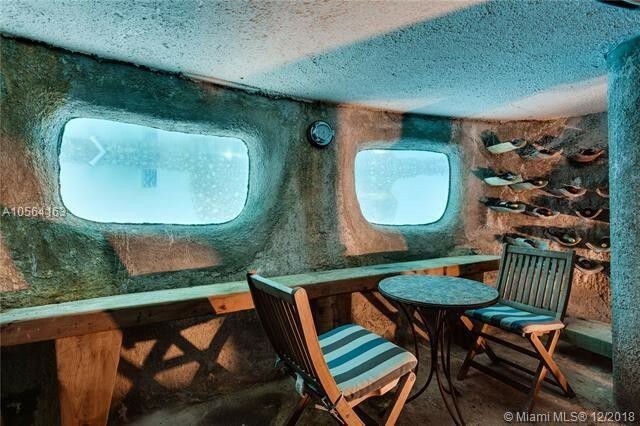 But an underwater wine cellar designed like a grotto? You’ve piqued our interest, and our palate. 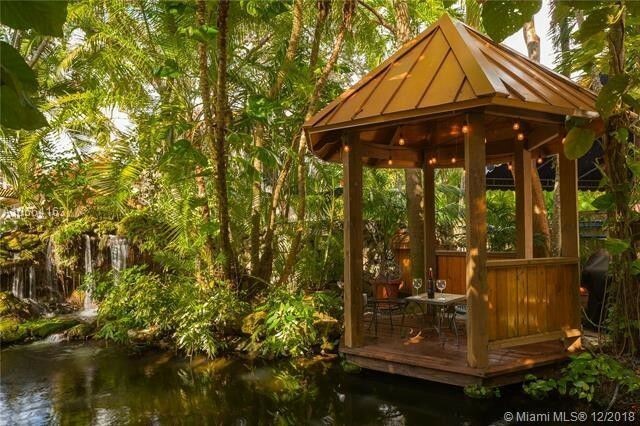 A home with an underwater wine cellar in Miami’s Coconut Grove neighborhood is now on the market for $1.95 million, represented by listing agent Carole Smith, of Compass in Coral Gables, FL. “An artist—Meredith Miller—lived in the house at one time, and she and her husband built” the wine cellar, says Smith. “It was her creativity that came up with” the addition. The renovation, which also added a koi pond and artist’s loft, was completed during the 1980s. 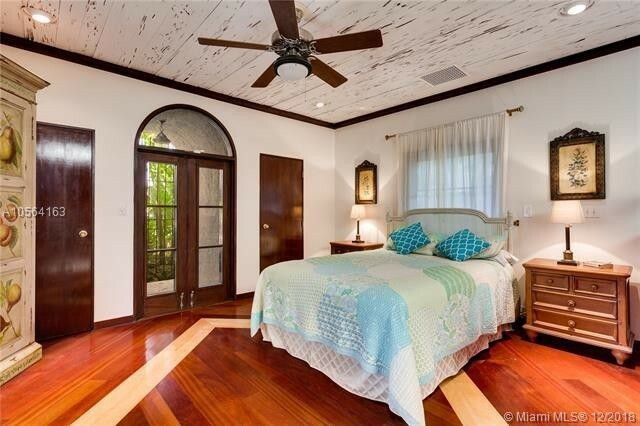 The 3,360-square-foot, four-bedroom home originally dates to 1925. Situated on a half-acre corner lot, “it’s surrounded by other 1920s homes,” says Smith. 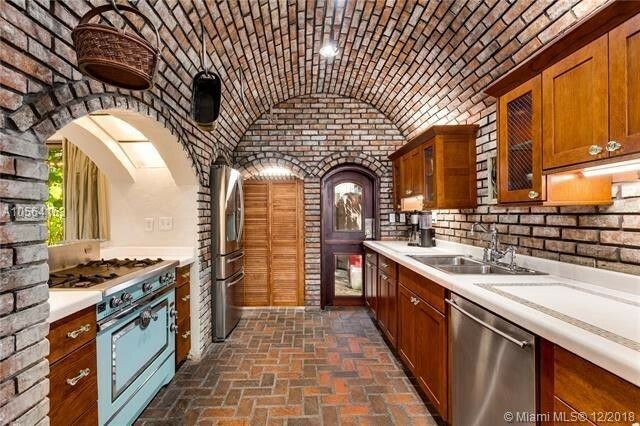 It’s the home’s (and neighborhood’s) historical character that Smith hopes will attract a buyer, although the one-of-a-kind wine cellar is worthy of a toast. Bottle storage is embedded into the stone walls for a seamless look. While sipping vintage Bordeaux, you can gaze out at a watery wonderland. William Jennings Bryan, secretary of state under President Woodrow Wilson, was the home’s first owner. Fans of the life aquatic will fall hard for this home because “you can see water—whether it’s the pond or the waterfall or the swimming pool—from every room,” says Smith. 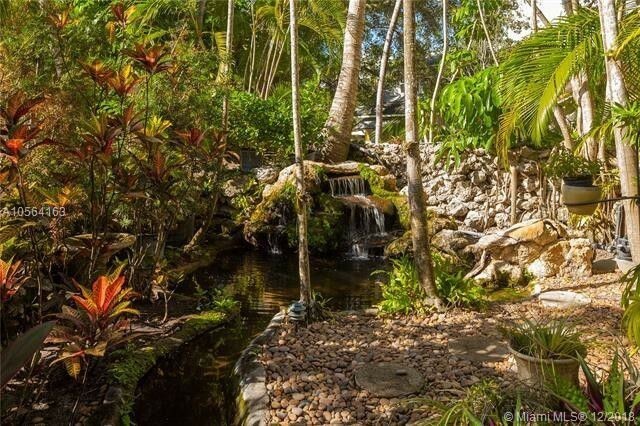 The koi pond is beneath an ornate foot bridge leading to the home. There’s also a large gazebo for reading or relaxing. With the self-circulating waterfall, “you do feel like you’re in Shangri-La,” says Smith. There’s also a water fountain in the courtyard. Overnight visitors in the cottage are in for a real treat: “If you are a guest in that house, you can lie in bed and look out at the pool,” says Smith. Home chefs will fight over the right to cook in the kitchen—especially once they see the robin’s egg-blue stove and its brick surround. Architectural details in the home include plaster walls throughout. The original fireplace in the living room is flanked by French doors. 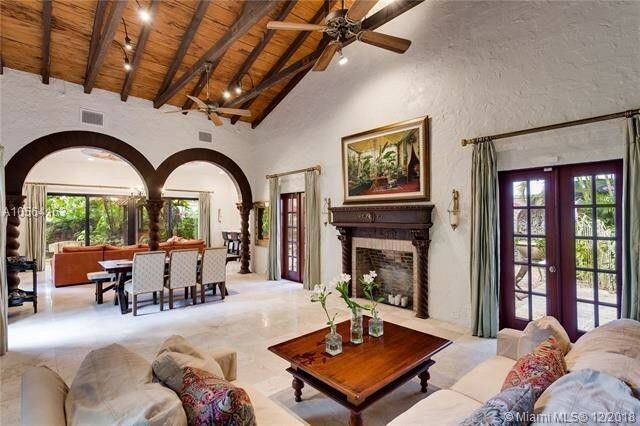 Fabulous arches—also in the living room—are crafted from wood and feature spool beams. They’re a nice complement to the room’s pecky cypress ceiling. Embedded stone lions flank an exterior door to the home. There’s also a private rooftop terrace and a sauna. But the pièce de résistance—in addition to the wine cellar—is the artist’s loft, which features a Juliet balcony and a private terrace. Given the luxe amenities and historical character of the home, buyers would be racing to put in an offer, right? Well, when faced with options including new spec homes and modern condos—both of which are prolific in Miami—it won’t be just anybody who puts in an offer. “The buyer is someone who will dare to be different,” says Smith. “They do not want cookie cutter. They love nature. They like the Coconut Grove history. They’re probably inventive and innovative.” And, we should add, fans of a nice bottle of vino. 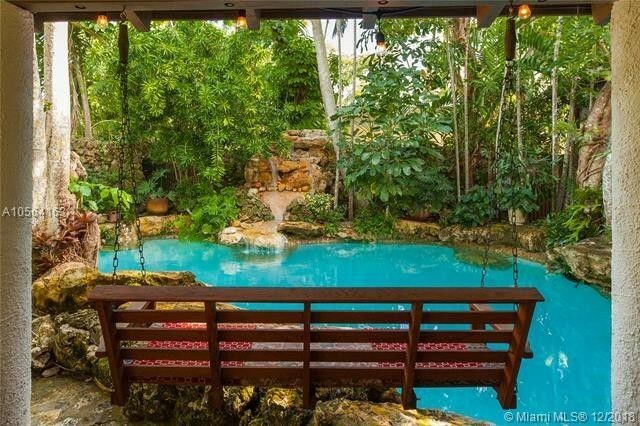 The post Historic Miami Manse Features Underground Wine Grotto With Water Views appeared first on Real Estate News & Insights | realtor.com®. © 2019 Vail Multi List, Inc. (VMLS). The information displayed herein was derived from sources believed to be accurate, but has not been verified by VMLS. Buyers are cautioned to verify all information to their own satisfaction. This information is exclusively for viewers’ personal, noncommercial use. Any republication or reproduction of the information herein without the express permission of the VMLS is strictly prohibited. Real estate listings belonging to brokerage firms other than Resort Real Estate Experts are marked with the IDX logo or icon. The detailed information about them includes the listing brokers name. Information is deemed reliable but is not guaranteed accurate by the MLS or Resort Real Estate Experts. Data last updated: 2019-04-23T07:11:29.55. © 2019 Summit MLS, Inc., a wholly owned subsidiary of Summit Association of REALTORS®. All rights reserved. The information being provided is for the consumer's non-commercial, personal use and may not be used for any purpose other than to identify prospective properties consumer may be interested in purchasing. The information provided is not guaranteed and should be independently verified. You may not reprint or redistribute the information, in whole or in part, without the expressed written consent of Summit Association of REALTORS®. Data last updated: 2019-04-23T07:27:09.65.